Oli Hawkins surveyed the upcoming campaign and insisted: Pompey fans have yet to see the best of me. The striker is confident he has more to bring to the table as the Blues bid for promotion from League One this season. Hawkins moved to Fratton Park from Dagenham & Redbridge for an undisclosed fee last summer. He made 42 appearances during his maiden campaign, scoring eight goals. The 26-year-old often was a back-up marksman to skipper Brett Pitman, while he was also served as a makeshift centre-back at times because of injuries. Hawkins felt he had a stop-start first season at PO4 and is adamant the Fratton faithful will see all of his prowess next term. He said: ‘I think Pompey fans have yet to see the best of me. They probably haven’t seen a 100 per-cent fit Oli Hawkins, or if they have I may not have got the time I should have or I maybe didn’t quite perform. ‘I have definitely got more to bring. If fans liked what they saw then I can only show more which I’m going to look to do next season. ‘I’ve met a few fans and they’ve said nothing but good things to me. They obviously know my situation so hopefully I can go into next season bringing my power and height to the team and score some goals. ‘I know that I can score goals. I just need more time and a little more faith maybe and I’ve proved where I’ve been before that I can score goals. I scored goals in lower divisions and I think I can bring it here if don’t have a stop-start season. 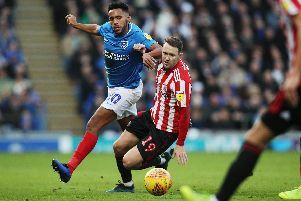 This summer marks Hawkins’ first full pre-season with Pompey. Last year, he arrived on transfer deadline day from Dagenham & Redbridge. The former non-league talent readied himself for the summer campaign by working with the Blues’ sports scientist Jeff Lewis while off duty. And Hawkins hopes he’ll reap the rewards when it reaches the business end of the season. He added: ‘I’m looking to get bigger and strong for the season ahead. ‘I worked more than I have in any pre-season before knowing the league and where I need to improve.